Edo State governor, Adams Oshiomhole, has disagreed with his colleagues in the governors forum, insisting that state governors must pay the N18,000 minimum wage which is a properly signed law. Speaking after the first Central Working Committee (CWC) of the Nigeria Labour Congress in Abuja on Friday, Governor Oshiomhole said the minimum wage agreement was reached after painstaking negotiations among labour, employers and government. He insisted that with current economic realities, the N18,000 minimum wage, which is less than 100 dollars today is nothing to write home about. He said, “I joined the NLC to protest to the National Assembly when they were going to amend the constitution to make the minimum wage a concurrent issue. “I said workers have a stake in this democracy. They are the ones who could afford to match the street and they matched the street for democracy. Democracy doesn’t have to run at the comfort or convenience of governors, ministers, and presidents. I believe that the issue in the economy hasn’t got to do with minimum wage. I have always also reminded my colleagues that the minimum wage was not imposed, it was negotiated and state governments agreed to it, the president signed it not under duress, there was no strike to compel the then president to sign it, he signed it voluntarily. 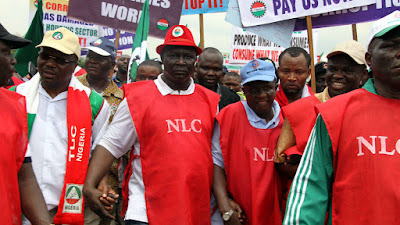 Meanwhile, the NLC and the TUC have warned that any attempt to undermine the payment of the paltry N18,000 minimum wage by the state governors will not be taken lightly by workers. Both unions were reacting to recent report in the national dailies saying that governors in their meeting in Abuja said they can no longer pay N18, 000 national minimum wage because it was imposed on them when oil sold for $126 as against the present price of $41 per barrel. Speaking in Abuja at a peaceful rally organized by Industrial Global Union, NLC president, Ayuba Wabba said workers will be mobilise to resist any of such move. He said, “This occasion also provide a platform for us to respond to the positions taking at the governors forum that the minimum wage of N18,000 is not sustainable. That we reject in its entirety, Nigerian workers will not take it lightly. We are not the problem, rather we are the solution. “The problem is that they have not been able to reduce the cost of governance. They should go and reduce their security votes. Let them also cut down on the number of their entourages. They must also be accountable to the citizens that voted them into power. We are going to resist any attempt to tamper with the payment under any guise. “Let them also note that the N18,000 was not allocated, it was negotiated through a tripartite process and it is a product of law that is even due for review. We are going to champion the review. Let us also put them on notice, if attempt is made to reduce, review or do anything outside the legal minimum of N18,000, which cannot even take us home, we are going to resit it. 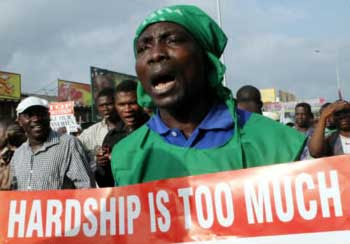 Nigerian workers will be mobilise to resist. “If they push us to the wall, because, he who is on the ground, will no longer be afraid of falling. We are already on the ground”, he said. On his part, the TUC president Comrade Bobboi Bala Kaigama Nigerian workers are disappointed that governors who preached love, peace and progress for all a few months ago are now singing in a different tune. Kaigama in a statement said there was a tripartite meeting, involving government at all levels, employers through Nigeria’s Employers’ Consultative Association (NECA) and the organized labour during the last minimum wage negotiation. He said, “We are not only disappointed but also we fear for our future as responsible citizens of the country because we are daily confronted with policy summersaults as development strategies. “To start with, we had thought that the very essence of setting up the Governors’ Forum is for them to meet once in awhile to discuss vital issues on how to move the country forward little did we know that we are absolutely wrong. For issues like reduction of national minimum wage and sack of workers to be discussed at what is supposed to be a high profile meeting sends a wrong signal. We are disappointed that governors who preached love, peace and progress for all few months ago is now singing in a different tune. “They have suddenly realized they can no longer pay $90 a month, which suggests to us that they are asking for a merger! How can they not pay N18, 000 but they can have a 10- car convoy, six for wife, pay themselves ridiculous pension and severance pay, have houses in Abuja,Lagos, Dubia, London, USA; send their children to primary schools in London and stash millions of pounds in their mansions. This is heartless and barbaric! We are disappointed because we had expected the Governors Forum to be angling about true fiscal federalism and how to harness the resources nature has bequeathed to every state. “We have always made it known that the cost of governance is high, especially as every state depends on federal government’s monthly allocation. Why should the innocent pay for the looting and stealing of our leaders. If they cut down salaries, how do they want business to flourish when the purchasing power is already very low. It appears all the hype on “anti -corruption” is hereby laid to rest, as workers must now steal to survive. “One would have thought that the governors will think out of the box to explore the possibility of increasing Internally Generated Revenue (IGR) through exploration of resources, albeit abundant ones in their vicinity to improve their state resources. Furthermore, time to rethink the exploration of mineral resources being entrenched in the Exclusive List is now. Methinks it is better made concurrent. Here, review of 1999 constitution along the line of 1963 Constitution is not out of place. "In conclusion, Congress wishes to state that it is vehemently against the move and would stop at nothing to ensure it does not see the light of the day."